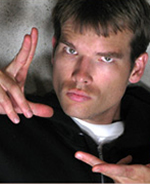 Kovas Lapsys is originally from the Chicagoland area, born and raised in the city of big shoulders. Born to a family of Lithuanian artists, Kovas was exposed to the world of art and design at a very early age. His parents, Raimundas and Raminta Lapsys, nurtured and encouraged his creative development from crayons to computers. Kovas studied graphic design and visual communications at Loyola University in Chicago, and later worked in Chicago for various design and marketing agencies. After his fiancé, and now wife, Erika relocated to Colorado for an employment opportunity, Kovas was more than excited to follow. As Kovas puts it, “Denver is a city as fun as Chicago, but with a much bigger backyard.” Trading “big shoulders” for “big mountains” was a natural fit. When Kovas isn’t working on the Buzz or other graphic design projects, he can be found… or rather can’t be found… playing somewhere in the Front Range. He is an avid hiker, mountain biker, snowboard and outdoor enthusiast. He also has a strong passion for the culinary arts. Now a resident of Colorado for 7 years, Kovas has been working with The Buzz going on a second year. He is excited to see The Buzz grow both in pages and in distribution since coming aboard, and hopes that the Buzz continues to be a strong vehicle of advertising success for the small business community. 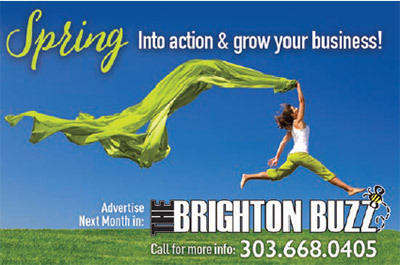 Kovas is committed to help The Buzz continue to be the voice of Brighton and the communities of north east Denver.